In recent years, chefs across America have sparked a trend of infusing their menu with both classic and creative fan-favorite entrees, featuring the iconic SPAM® brand. This week, the coast-to-coast SPAMERICAN™ Tour will kick off in Los Angeles with Food Network Chef Sunny Anderson unveiling a special menu and, as the truck travels to popular events across the country, features partnerships with local chefs from L.A. to Charlotte and everywhere in between. At each of the 12 stops, fans will enjoy a signature recipe from Anderson, alongside SPAMTASTIC™ creations from local chef partners, all while experiencing a taste of the brand’s fun-loving personality and learning about its history, versatility and cultural impact. While the truck makes its way across the country, signature menu items will be unveiled featuring unique dishes created by the locally based chefs, including a delicious Kimchi SPAM® Musubi Croissant by Chef Sharon Wang in L.A., a SPAMmy Tot by Chef Robert Lam of San Francisco, and a SPAM® & Jack Pretzel Sandwich by Chicago’s Chef Kevin Hickey. 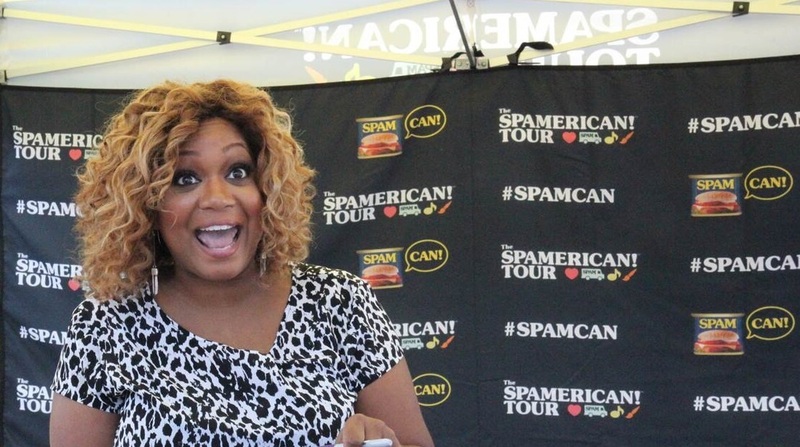 Long-time brand fan, Sunny Anderson, created a Coconut SPAM® Spears with Spicy Pineapple Chutney dish which will be a mainstay on the menu throughout the tour. Fans can find the SPAMERICAN™ Tour truck at a variety of popular events over the summer including the Toyota Grand Prix of Long Beach, Denver’s Cinco De Mayo Festival and the Atlanta Jazz Festival. Beyond enjoying a variety of SPAM® dishes, fans will have the chance to learn interesting brand trivia, see one-of-a-kind SPAM® brand-themed art, and even enjoy musical performances with instruments made out of recycled SPAM®cans.